medium was a moving target with evolving capabilities — silent, talkies, color, and special effects. Of course, movies came into their own when directors applied new filming techniques and developed new storytelling mechanisms that took advantage of the new technology in ways that a filmed play could not. Similarly, an online course can be, and should be, far more than filmed videos and written documents uploaded to an LMS. 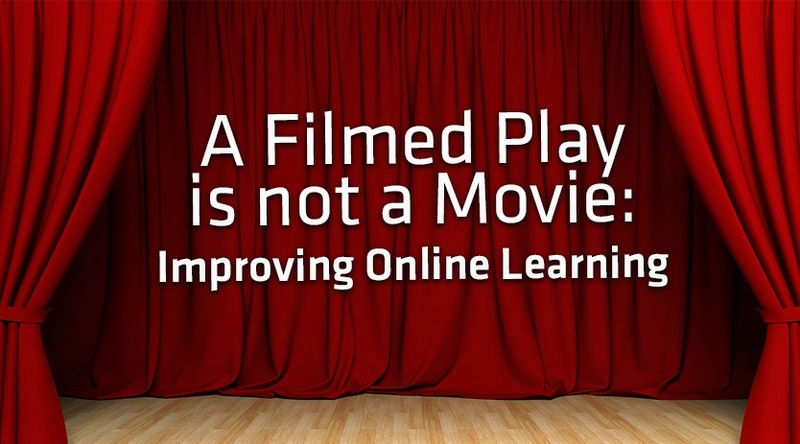 Many of us are currently at the “filmed play” stage of online learning. Certainly it is clear to everyone that the capabilities of this medium are both evolving and still being explored. Here at ExtensionEngine we believe that innovative online learning lies at the intersection (and integration) of platform, pedagogy, and content. In the following I go into a bit more detail on this idea. During a conversation last week with the head of online learning at a large, successful, and innovative research university, I was asked fairly directly why schools should increase their investment, or even continue to invest, in putting classes online. Mind you, this university has upwards of 75 classes on one or the other of the major MOOC platforms, so this was a serious question from a major player in the online learning industry. It costs money to make online classes and keep them running. While many universities have been committed to educational outreach on these MOOC platforms, they are generally equally committed to not relying on tuition funds from on-campus students in order to produce these courses. This means that mindlessly throwing videos up on a MOOC platform and declaring victory is out of the question for organizations who want to be leaders in online learning. These universities and colleges have special faculty who have many demands on their time; simply recording them and putting the videos up in an LMS is not something that excites them (either the faculty member or the head of online learning). This hasn’t kept them from producing these courses; many reasons, including competitive necessity, can be invoked as justification for MOOCs and/or SPOCs. An online university class should not be the educational equivalent of a filmed play. It should deeply integrate new technologies for the benefit of both teachers and learners. It should not force old processes and resources into the new approach. The sweet spot of online learning, the point at which it is enriching the ongoing teaching and learning, is where platform, pedagogy, and content are inseparable. 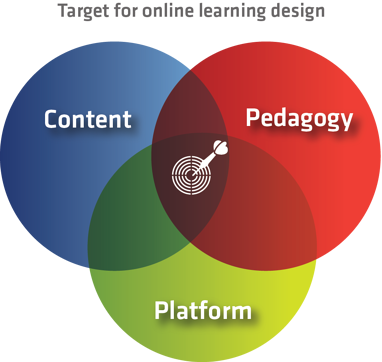 The platform should support and instantiate the pedagogy while also enabling search and discovery of the digital content. The pedagogy should take advantage of the computational platform (powerful servers for social and computational support and powerful Web browsers for effective interface implementations) and the instant availability of and extensive storage capability for digital content. The content should be digitized, easily searchable, and modularly designed for multiple deployments. Access to a wide range of digital content should be a top level consideration in the pedagogy of the course. It should also be integrated into a network of other learning resources on the platform so that the learner can easily explore other, related content. It is possible given today’s technology and understanding of teaching & learning to design, implement, and run an online course at scale that is interesting, engaging, and effective. Those of you at leading colleges and universities want to do more than “film plays;” you want to create the educational version of Citizen Kane , modern and distinctive online learning experiences. However, many universities and colleges neither have the staff to create and run such a course nor have the desire to share revenue on that course (or program). That’s where we come in. If you work at such an organization, I encourage you to think about working with ExtensionEngine. We have the knowledge of the education market, pedagogical and design skills, technology expertise, and process management abilities to deliver such a course while working with your faculty or subject matter experts. If this interests you, please either schedule a meeting with me or send me an email so that we can explore your needs and interests.